This congress notes the continued attempts to privatise the education system by both the Labour and ConDem governments. Congress further notes that, with the so-called ‘austerity’ measures, education is facing its biggest cuts since the 1950s. Congress believes that the proliferation of academies, which are replacing LEA-funded schools and which have brought private finance into the running of schools, are the precursor to full-scale privatisation in primary and secondary education. Along with the increase in religious, private and grammar schools, they are paving the way for the re-establishment of the two-tier system in state education, abolishing comprehensive schooling. Congress notes that, in the area of further education, government cuts are set to remove the funding for adult education (those over 24) from September 2013, which will result in anyone wanting to pursue level 3 qualifications having to pay fees. This can only push more working-class people out of the education system at a younger age and lower stage. Congress further notes that, in higher education, the continued increase in tuition fees, and now the introduction of ‘top-up fees’, has made the cost of university education a luxury rather than a right, with many of those who do make it to university facing debts of well over £30,000 when they leave. This congress therefore asserts that, while private finance is being brought into schools to siphon profit out of the education system, the cost of actually providing that education is being gradually shifted onto those being educated, making it harder and harder for working-class people to remain in education. This is backed up by the fact that the number of young people in education is already rapidly falling, with 15 percent of 16-24-year olds not in education, employment or training nationally. In some areas, this figure now reaches as high as 25 percent. Congress recognises that, under capitalism, the education system is not geared to developing the capabilities of all who live within our society. As the crisis of capitalism deepens, the ruling class’s ability to provide the sop of free education to the working class in Britain is diminishing, leaving behind a third-rate education system aimed only to fit us for wage slavery or the scrap heap of unemployment. This congress recognises that only socialism will bring free universal education for all, where the needs of the whole of society are the priority. However, in the struggle towards the overthrow of capitalism, we recognise the need for raising the consciousness of those facing the onslaught of capitalism and for engaging with these struggles. Free universal education for all. The abolition of all private schools; academies; grammar schools and religious schools. The cancellation of all PFI contracts and a return to public funding. A ban on all armed force and police propaganda and recruitment on education premises. The scrapping of ALL tuition fees, including ‘top-up’ fees, further education fees and any other disguised version of fees for education such as the proposed ‘graduate tax’. Actively spread awareness of the educational attainment of socialist countries such as Cuba, the DPRK, and the Soviet Union before its collapse, since they provide vivid and inspiring examples of what is possible when questions of maintaining minority rule or providing capitalism profit are removed from the education equation. Bring all possible influence to bear on the National Union of Students to step up its campaign against ALL fees, as well as to break its link with the imperialist Labour party, in order that it might actually become a real fighting force for students in Britain. Behold the miracles worked by the application of market principles to education! Pretending concern over the number and differing quality of exam boards and the validity of the grades they award, education secretary Gove ignored the obvious solution (a single board under state control with a common set of criteria). Instead, he let it be known that in the coming ‘rationalisation’ the invisible hand of the market would fix everything, with weaker boards driven to the wall whilst fortune smiled on the survivors. Coincidentally he also dropped the hint that the key to survival in this competition would be the willingness to tackle ‘grade inflation’ – ie, stop awarding so many A, B and C grades. Taking the hint, the exam boards fell over themselves to magic up a startling ‘grade deflation’, leaving thousands of students stranded in the ‘D’ and ‘E’ twilight zone specially reserved for those whom capitalism declares to be losers. Between January and June, the goalposts were shifted so that students who would have secured a ‘C’ in January were stuck with a ‘D’ in June, for producing exactly the same work. As Gove presses on with his mission to transform every last LEA-funded secondary school into an academy, the agenda is clear. The harder it gets for secondary school students to score top grades, the faster Ofsted can declare their schools to be ‘failing’ and hence ripe for enforced rebranding as academies by private sponsors. And now that schools have been told that the minimum percentage of pupils who manage to grab five high-grade GCSEs must be raised from 35 percent to 40 percent, Ofsted should have no difficulty in collecting the required quota of scalps. Whilst Gove’s flat-footed tactics have had unintended shambolic consequences, there is nothing accidental about the underlying capitalist strategy: the abolition of free comprehensive schooling, dumbed-down education for the masses and a privileged education for the moneyed elite. Whilst the NUT correctly calls for the immediate re-grading of July’s exams and mumbles about an ‘independent review’, working class students and their parents need to set their sights higher and campaign to abolish all private schools, academies, grammar schools and religious schools, establishing in their place free universal education for all. It is the crisis of the capitalist system which is wrecking the educational prospects of a whole generation, a crisis which the working class did not create and for which they should refuse to take any responsibility. If capitalism is unable to provide for the educational needs of the workers, then let the workers look to the educational achievements of socialist countries like Cuba, the Democratic People’s Republic of Korea and the historic Soviet Union. A group of 15 students are sitting at the back of the lecture theatre. Some are wearing scarves associated with the Palestinian movement, others hold the Palestinian flag. They are silent, apart from the few words one of them utters at the beginning of the lecture explaining why they are there: as part of a symbolic silent protest to show solidarity with the people of Gaza. On the walls are photos of the conflict, showing men carrying blood-splattered children and posters calling for the massacre in Gaza to stop. In the corner of the room is a pile of sleeping bags and a table stacked with bottled water and cartons of fruit juice. Over the last week, a storm of student protests has gathered over 16 universities across England, suggesting that students are awakening from the political apathy of which they are often accused. It’s enough to bring a tear to the eye of ageing sixties radicals. Starting at the School of Oriental and African Studies, occupations in protest at events in Gaza spread to King’s College London and the London School of Economics (LSE), then out of the capital to Sussex, Warwick, Newcastle, Oxford, Essex, Birmingham, Leeds, Manchester and Manchester Metropolitan, Bristol, Nottingham, Salford, and Kingston. At Sussex, students have occupied the arts lecture theatre 24 hours a day sincea meeting with a controversial British Palestinian academic, Azzam Tamimi, on Tuesday night. “The action has brought together socialists, Islamists and even students from the green movement who realise the detrimental effects of war on the environment,” says Gwen Wilkinson, a first-year psychology student from Newport. The occupiers have issued the university with six demands including the issuing of a statement condemning the “atrocities perpetrated by Israel in the Gaza Strip” and calling on it to disinvest from “companies complicit in human rights abuses”. At night they are using the internet facilities in the lecture hall to contact groups in the West Bank and are hoping to get through to Gaza. Eleanor, 20, a first-year English and history student, has signed their petition. Although she says many students are attracted to Sussex by its radical history, she is reluctant to get involved in the occupation. “There are two sides to the story and Hamas were firing rockets into Israel,” she says. The numbers involved are a tiny proportion of the 2.5 million-strong UK student body, but they appear to speak for many more, and to have caught a wider mood. So far the protests have been peaceful and treated gently by the authorities, though some Jewish students have complained they feel threatened. King’s students see the university occupations as a resurgence of the kind of action that took place during the anti-apartheid movement of the 1980s. The zenith of British student political activism in the 1960s does not warrant a mention now, not even the protest by LSE students against Ian Smith’s regime in Rhodesia (now Zimbabwe), let alone those in 1968. Presumably for today’s students, many of whom were born in the early 1990s, the sixties are ancient history. Unlike the anti-apartheid protesters, today’s students have the power of the internet at their disposal. They have put it to good use, publicising their campaigns through social-networking sites, making regular updates on blogs, and supporting one another through emailed messages of solidarity. All the occupying students have issued similar demands: a statement from their vice-chancellor condemning the Israeli bombing of Gaza; severing university investment or links with companies supplying equipment used in the conflict; sending surplus computers and books to students in Gaza; scholarships for Gazan students – and no repercussions for their activism. King’s students also want the university to remove the honorary degree it bestowed on Israel’s president, Shimon Peres, last November. In Oxford, students occupying the historic Clarendon building called on Balliol College to cancel a lecture series in Peres’s honour. University officials have on the whole agreed to help students fundraise and send equipment to Gaza, but vice-chancellors have carefully sidestepped demands to issue political statements condemning Israel’s conduct. So far, four of the occupying student groups have claimed victory: at the School of Oriental and African Studies and the University of Essex (after two days), and at Oxford (after just 10 hours), and the LSE. 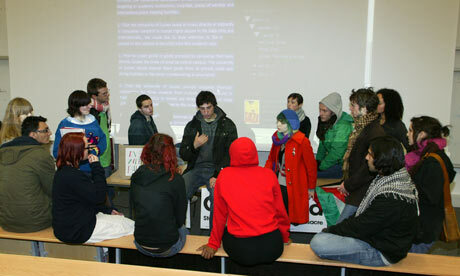 At the LSE, the student sit-in lasted a week but ended peacefully when the director, Sir Howard Davies, agreed to meet most of the students’ demands. In a statement, he said he understood the students’ concerns and that the suffering of civilians in Gaza was “painful to observe”. But he refused to issue an official university condemnation of the conflict or to publish regular financial statements spelling out the university’s investment in companies involved in supplying arms to Palestine and Israel. Michael Deas, a third-year environmental policy student involved in the LSE occupation, said students were “delighted” with the outcome. “It’s a real victory for student activism, particularly forcing the director into making a statement,” he said. Police evicted protesting students at the University of Birmingham after 12 hours. In recent months, student activists have not limited themselves to sit-in protests over Gaza. They have boycotted careers fairs over university links with companies of which they disapprove – distributing badges, draping banners over displays and even dumping bags of coal to make their point. The ongoing Palestinian-Israeli conflict has driven hundreds of students to act. But they still a tiny minority. Officials at Warwick – where students have demanded an end to links with BAE, GE Aviation, MBDA, Qinetiq and Rolls Royce – pointed out last week that more than 1,000 students had attended a careers fair where those companies were represented. Careerists, it seems, outnumber the idealists. “Learn, baby, learn” was a slogan of the black rights movement in America’s ghettoes a generation ago, but it also epitomises the idea of education as the central pillar of Palestinian identity – a traditional premium on schooling steeled by occupation, and something the Israelis “cannot abide… and seek to destroy”, according to Dr Karma Nabulsi, who teaches politics at St Edmund Hall, Oxford. “We knew before, and see more clearly now than ever, that Israel is seeking to annihilate an educated Palestine,” she says. The Palestinians are among the most thoroughly educated people in the world. For decades, Palestinian society – both at home in the West Bank and Gaza, and scattered in the diaspora – has put a singular emphasis on learning. After the expulsions of 1948 and after the 1967 occupation, waves of refugees created an influential Palestinian intelligentsia and a marked presence in the disciplines of medicine and engineering across the Arab world, Europe and the Americas. Schooling and university studies are the fabric of life despite, not because of, circumstances: every university in the occupied territories has been closed down at some point by Israeli forces, many of them regularly. However, the closures and arrests of students (more than 300 at Birzeit university in Ramallah, says Nabulsi) only strengthens the desire to become educated. In the current offensive, Israel began attacking Gaza’s educational institutions immediately. On only the second and third day of air attacks last week, Israeli planes wreaked severe damage in direct strikes on Gaza’s Islamic University. The main buildings were devastated, destroying administrative records, and, of course, ending studies. The Ministry of Education has been hit twice by direct hits from the air. The Saturday of the ground invasion was the day on which most students in Gaza sit their end-of-year examinations. In the majority of cases, these had to be abandoned, and it remains unclear whether they can or will be sat again. Other schools were also attacked – most notoriously the UN establishment in the Jabaliya refugee camp where at least 40 people were massacred on Tuesday. On Sunday, another Israeli air strike destroyed the pinnacle of Palestinian schooling, the elite and private American International School, to which the children of business and other leaders went, among them Fulbright scholars unable to take up their places in the United States because of the Israeli blockade. Ironically, the same school was attacked last year by a group called the Holy Jihad Brigades, and has been repeatedly vandalised for its association with western-style education. The school was founded in 2000 to offer a “progressive” (and fully co-educational) American-style curriculum, taught in English, from kindergarten to sixth form, and was said by the Israelis to have been the site, or near the site, from which a rocket was fired. A night watchman was killed in the destruction of the building. Ramzi Aburedwan, who runs the Al-Kamandjati classical music school in Ramallah, argues: “What the Israelis are doing is killing the lives of the people. Bring music, and you bring life. The children who played here were suddenly interested in their future”. In a recent lecture, Nabulsi at St Edmund Hall recalled the tradition of learning in Palestinian history, and the recurrent character of the teacher as an icon in Palestinian literature. “The role and power of education in an occupied society is enormous. Education posits possibilities, opens horizons. Freedom of thought contrasts sharply with the apartheid wall, the shackling checkpoints, the choking prisons,” she said. Transcribed from the rally held in Southall, London on 8 November 2008 to celebrate the 91st anniversary of the October Revolution. The video of this speech can be found at the CPGB-ML YouTube page. I’m going to talk a little bit more from the perspective of someone of my generation: what does October mean to me, and why do I think it should matter to other people like me? Now, I grew up at a time of rampant anticommunism; I grew up in Thatcher’s heartlands, one of ‘Thatcher’s children’, as our generation were called. We were taught to be selfish, we were taught to believe that it’s the law of the jungle, it’s a dog-eat-dog world, and that capitalism really is the ultimate expression of ‘human nature’, and that by being selfish, by thinking only of yourselves, by just fighting for you – and maybe your offspring – you are just reflecting reality, and that if society teaches you to be that way, it’s because that’s how people are. Bourgeois ideology was truly in the ascendant when I was growing up, and there was no-one really countering this barrage of propaganda. We had English literature lessons where we read Animal Farm and learned to repeat that Stalin was a crazy, murdering, stupid butcher and Trotsky was the true leader of the revolution. We had history lessons where we learned that Trotsky led the Red Army to victory and Stalin somehow hoodwinked and then later personally bullied the Soviet people into following him. What was the aim of all of this? The aim was to teach us that revolution is pointless; that, no matter what your intentions, if you try to change society, it will go wrong; and to negate the real building of socialism in the Soviet Union by slandering the leader of that building. By slandering Stalin, by telling you that Stalin was an evil murderer, they basically say that everything that was achieved in the Soviet Union wasn’t achieved; it didn’t happen; it wasn’t true. And people can say ‘It’s never been done, socialism’s never been built’ because we’ve been taught all these lies about the Soviet Union and about Stalin’s leadership of the Soviet Union. Anti-Soviet slanders are in every field of life. I did a music degree and it’s amazing how it creeps in. You wouldn’t think you could go and study music at university and several times a week get some kind of anticommunist slander, but we did. The great music of Stravinsky and Shostakovich was produced at the barrel of Stalin’s gun! [Laughter] Somehow or other, they made great music – it would have been much better if Stalin hadn’t been there, obviously; if they’d managed to escape to the West, which was obviously what really wanted to do, everything would have been much better for them! The fabulous child care and maternity provision provided by the Soviet Union? The children were treated like automatons! Their mothers were forced to work! The profession care was impersonal and uncaring! And to cap all of this hostility from the official sources – from the press, from the school curriculum, from the media – we grew up with a left-wing movement that was pretty much saying the same thing – denouncing and disowning Stalin and all the achievements of socialism. People in the trade unions, people in the Labour party, the Socialist Workers’ Party, the Communist Party – these were the people who you came up against, who told you they were socialists; that they believed in the working class – they all agreed. When I was growing up, whichever one of these shades of ‘left’ you cared to talk to, they would all tell you: Stalin was a mass murderer, probably Mao was too, and Kim Il Sung the same; socialism has never been put into practice anywhere; Marx wouldn’t have approved of Lenin’s revolution; Lenin wouldn’t have approved of Stalin’s building of socialism. They’ve been cut off from the science of revolution and from the ideology that offers them hope for a future free from war, poverty, unemployment, homelessness, degradation and disease. Such has been the success of this sustained propaganda campaign, that even the few socialists that did defend the Soviet Union when I was young didn’t do a very good job of it. We’ve been taught to feel so culturally alienated [from the Soviet Union] that it’s hard to bring it to life; it’s hard to believe it’s really as good as we wanted to say it was. The repeated assertions that I talked about earlier create an atmosphere of overwhelming associations about what life in the Soviet Union and eastern Europe was like: inhospitable, joyless, we think of gulags in Siberia, everything was grey, everybody was a bit of an automaton, there was no choice, there was no inspiration, there was no magic to life. But we do need to understand the significance of the Soviet Union. We need to read works of literature produced in the Soviet Union. They bring to life life under socialism like nothing else can. And we should read books about the years when socialism was being constructed in the Soviet Union. Novels like How the Steel Was Tempered by Nikolai Ostrovsky, The Zhurbins, Ivan Ivanovich, or books like Soviet Democracy or The Stalin Era; books that describe the life of ordinary people at a time when the Soviet Union was going from strength to strength. From the time of the revolution up until the time of Stalin’s death, if you read these works of literature, if you read the works of eye witnesses, [you find out that] the Soviet Union was the most incredible place to live, and the Soviet novels illustrate really beautifully how socialism can unlock the tremendous creative powers of working people, imbue them with a spirit of enthusiasm for their work and with a feeling that they really can achieve anything that they put their minds to. We need to disseminate these works and ideas; there’s a much bigger audience for them than you might think, especially now. At this moment now, the crisis of capitalism is really providing the best opportunity that I’ve seen in my lifetime to talk to people. Suddenly all sorts of people who wouldn’t have been able to get past the word ‘socialism’ and hear anything else that came out of your mouth – today you can talk to them about child care in the DPRK; you can talk to them about the building of socialism in the Soviet Union and they’ll listen to you; they want to hear; they’re interested in answers now. Where will the money come from? That’s what we’re always told. And it’s an unanswerable question. Where will the money come from? Oh, well, ok, fair enough, there’s not enough money, so that’s just the way things are, right? And people have swallowed that. But it’s very hard to swallow that when suddenly £500bn is found for the banks – out of nowhere, apparently! [Applause] And I think that’s been the most incredible wake-up call for everybody. While they see that their pensions, their health care, their education are all under threat, that they cannot rely on their pay packet being there next month, that they cannot rely on their house being there next year, but that actually money can be found for the things that matter to the ruling class – and suddenly you see what are the things that matter to the ruling class and what aren’t. Why is it that our grandparents look back so fondly on the second world war, a time of such hardship? They talk about the ‘war spirit’. What was the war spirit? It was the collective spirit. The reality is that people are collective animals; we feel best when we are contributing to something that isn’t just yourselves, our own little lives in our own little boxes. We feel happiest when we are working for something that feels like it means something bigger; we feel happiest contributing to society. But we don’t get that opportunity. We look for it; we try to find it; we try to tell ourselves that our jobs are meaningful and we feel bad if we can’t find a way to believe that. Even those who are comparatively wealthy in our society don’t feel it. They don’t feel it because there’s constant insecurity. Even quite well off middle-class people are only a couple of pay packets away from destitution, from defaulting on the mortgage, from losing out on their pensions, from not being able to provide their children with what they need for a decent life. And that’s in the good times! And as we see now, you can’t rely on the good times. You play the game according every way you’ve been taught and you win, you’re one of the lucky few who does everything you’re told and it works out for you – you’ve got your savings pot, you think you’ve got what you need for your pension, you’ve invested in a few properties. But tomorrow, maybe the properties aren’t worth anything, maybe the money in the bank isn’t there any more, or it isn’t worth anything any more; maybe suddenly tomorrow you have to pay for health care you didn’t have to pay for before, or your pension’s taken away from you. You can’t rely on anything under capitalism; there’s no such thing as security no matter how hard you work, no matter how much you accumulate. And that’s why, no matter how much people do accumulate in this society, as they’ve been taught to – accumulate to find happiness – they don’t feel happy; they don’t feel comfortable. It’s the secret of middle-class whinging – all these well-off people who always have something to moan about! Everybody thinks if they had ten grand a year more, they’d be happy. But the people the next ten grand up, they’re not so happy either – they think they need another ten grand! And then we compare that with the picture of life in a socialist country. Can you imagine living in a world where every job makes a contribution to building a better life for people? That in itself would be such a great motivator and inspirer! That in itself would unleash the creativity of so many people, bring out people’s natural collective spirit. And I bet if you’d gone to the Soviet Union, you’d have heard something very similar. North Koreans will talk about their self-reliance, their pride in being Korean and achieving things by themselves for themselves. I think a socialist society inspires them to build and to achieve; it makes them feel valued, it makes them feel part of something, it makes them feel that their work is useful. They can see the fruits of their labour in front of them and it comes back to them and to their neighbours a hundred fold. Imagine never having to worry about paying the rent; never having to worry about health care, education provision for your children, university fees. Imagine never having to worry about whether or not you’ll still have a job tomorrow; never having to worry about whether there’s going to be food on your table or your children’s table today or tomorrow. Cuba’s achievements in the fields of health and education are relatively widely known now, but it’s not so well understood that it was the Soviet Union that pioneered all of that. It was the Soviet Union that was the first to provide these kind of things – and that at a time, not only when they had just fought a very debilitating war – first the revolution, then the civil war, then the war of intervention – but when the rest of the world was going through the great depression – the mirror of the crisis we’re having now. The rest of the world was plunged into total poverty, but the Soviet Union was going from strength to strength; they were providing facilities – first class, world class facilities – for ordinary working-class people of the kind that before then had only ever been dreamed about. Like the Soviet Union before it, if you go to the DPRK today, something that hits people when they go there (and I’m sorry to say I never have yet, but it’s something that’s always related to me when I talk to people who have been) is that there are no advertisements on the streets. Can you imagine a life free from that bombardment of rubbish? You don’t appreciate how much it oppresses you and weighs down on your mentality – all the time, in your face – you have to learn not to look around you; learn to walk around in your own little bubble to keep it out, blaring out at you. You’re not even free from it in a petrol station forecourt, in Sainsbury’s – they’re advertising at you non-stop, all the time. To live in a place where not only do you not have that, but instead you have people’s art in the streets; celebrations – statues and posters – artwork celebrating the achievements of you and your fellow people. Ordinary people’s buildings made beautiful – turned into palaces. They have children’s palaces in Korea, and the Soviet Union did just that sort of thing, constructing the most incredible, artistic buildings where ordinary people were every day, like the underground system in Moscow; places where ordinary people go made beautiful, to uplift them, to make them feel respected, valued; to make them care about their society and feel that they in turn were cared about. Comrade Brar’s already talked about how the Soviet Union provided for mothers and children. It’s something you can’t underestimate the impact of – and so far in advance of the rest of the world. It’s the first place where they really showed that the liberation of women is about practical things – it’s not just about allowing women to take part in jobs, but freeing them to do so: providing the best possible child care, where you feel happy to leave your children; providing huge amounts of paid maternity leave, both before and after the baby’s birth, for the optimum health of the mother and the baby. I was reading recently how as soon as they knew a woman was pregnant, they’d move her into easier physical work if she was in something that was quite taxing. The day the baby and the mother came home from the hospital, who came to see them? Not just the nurse – an obstetrician! In the house! They really, really cared about the health of women and of children. They set up crèches, laundries, kindergartens, public dining rooms – all the services that Comrade Harpal talked about before – to free women and allow them to really take their place in society, and to give children an equal start in life. There was recently a report published by the World Health Organisation. It talked about health inequality in the world, and the conclusion that they [the authors] came to – well, the conclusion between the lines was, we need socialism! [Laughter] – they said: people need jobs, they need decent housing, people need access to culture. They talked about illness prevention, which of course was the core principal tenet of the Soviet medical system, and they talked about children needing an equal start from the beginning. They talked about the importance of pre-school education; they talked about the importance of involving the whole community in that type of pre-school education – it’s not just a question of sending them off to a kindergarten for a couple of hours and bringing them back again, but a whole community really needs to take part in that. But you need to have a community to do something like that; people need to be organised as a community in order to implement those kind of programmes. There are only socialist countries in the world today that do that – it’s only in Cuba, it’s only in the DPRK where you see those kind of programmes in action – and it was in the Soviet Union that you saw them first. Imagine living in a world where education throughout life was the norm; where opportunities to develop your potential are provided as a matter of course to everyone, at no cost, with no penalty to your family if you decide to take them up or to have a change of career – where you don’t have to worry whether your children are going to eat if you need to retrain. We live in a society that criminally squanders and suppresses the creative and productive potential of the vast masses of humanity. Even the best off workers often feel isolated and insecure, and the vast majority are only ever one or two pay packets away from destitution. None of the main contradictions of imperialism can be solved without proletarian revolution. We will never have job or housing security or secure pensions as long as imperialism exists. Our job as socialists under capitalism is to use the daily and hourly crises of imperialism to expose the system and explain to workers that as long as this system continues the rich will get richer, the poor will get poorer, the crises will get deeper, the wars will become bigger and bloodier. October proved that work under socialism is transformed from meaningless drudgery into a vehicle for unlocking the potential and creativity of the working class. Thank you very much Joti, but you were quite wrong in saying that I’d spoke your speech earlier; it’s quite different. And to the extent that there is some repetition, then I think it’s perfectly alright. As the old Latin saying goes: Repetition is the key to learning! You have talked of the power of advertisements. We must advertise our ideology – the more often we speak about it, the better. I hope each speaker will be able to repeat some of the things, because they are essential. We are in a minority and we’ll never become a majority unless and until we actually continue to insist on speaking the truth, whatever the cost. We’ve somehow been thrown back in the imperialist centres to being in a similar position to that of the early christians – you know, you’re hounded from place to place, but you’re nevertheless able to convey what they used to call ‘the lord’s message’. [Laughter] In our case, it is the message of the working class. We are the majority. Why are we such fools that we accept the propaganda of the tiny minority that actually keeps us in subjugation? We shall not accept that as being the fate of humanity.